Since you have successfully logged in to cPanel, you will see the cPanel interface. This can be a bit overwhelming if you have never worked with cPanel and this is your first time logging in. We'll discuss the most important features in cPanel. 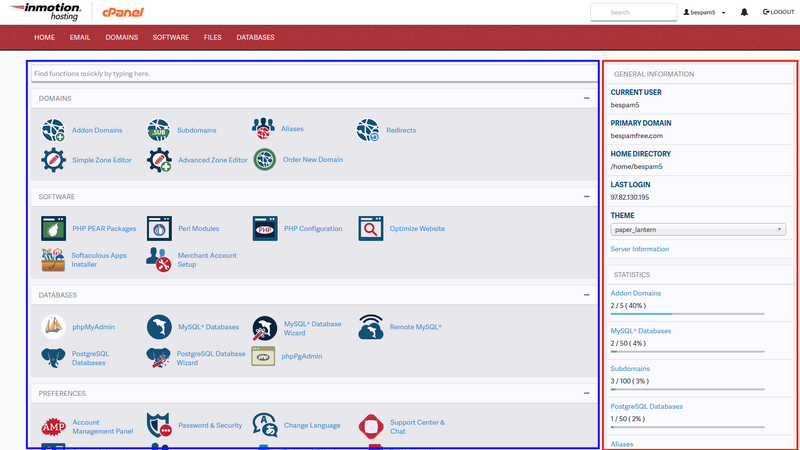 Here is a screenshot of cPanel with the two main sections outlined in red and blue. The RED section is your website statistics. This shows general information such as your Shared IP address, Disk Space, what server you are on, how many emails accounts you have, how many databases you have ,and much more. This information will change based on any modifications you may make to your account. The BLUE section are the features of cPanel that you have control over. Each section has it's own header to better organized the options in common groups. The main sections most customers use is Mail, Files, and Databases. Did you know you could brand your cPanel accounts if you are reselling hosting? Learn more about reseller hosting with cPanel. Please check the next article on Using the cPanel Video Tutorials. If you missed our previous article, please see the How to log into cPanel tutorial. For more information on this course please visit Getting Started in cPanel.